Hi, I’m Jess. I’m a 25 year-old from Minnesota (you know, where Marshall from How I Met Your Mother is from). I like tattoos, animals (especially cats), houseplants, beer, coffee, biking, concerts & wearing dresses. And I love to travel. Recently, I did the whole “quit my job” thing, and spent four months traveling solo across South America on a daily budget of $60 USD per day. From one backpacker to another, I’ve written my stories, advice, and everything else I wish I’d known before my travels to help others step outside their comfort zone and make the most out of their trip. Due to budget constraints and the vast distances between major destinations, I chose the few I was most interested in and skipped the rest. In total, I spent just 12 days in Argentina. I crossed the border from Brazil into Argentina at Iguazú Falls, spending a day exploring the falls on each side. From there, I flew to Buenos Aires where I spent a fun 5 days exploring the expansive port city, watching Tango dancing, and drinking my fair share of cheap, tasty wine. I spent 2 days in Mendoza, drinking even more cheap, tasty wine, before finally making the LONG journey south to El Calafate in the Patagonia region– one of my most anticipated destinations during my four-month trip around South America. …and they were a whirlwind 12 days! I crossed the border by bus– heading to Puerto Natales from El Calafate, Argentina– in the Patagonia region. I spent 2 days in Puerto Natales, the launching point for the legendary Torres del Paine National Park, and a day in Punta Arenas before flying due north to Santiago. I spent a sunny day there before making the short trip to Valparaiso on the coast for two days of street art and winery tours in the nearby Casablanca wine region. Then, I headed back to Santiago to catch a flight up to San Pedro de Atacama– the driest place on earth– for 3 days before crossing over into Bolivia. White, green, and red mineral lakes, snowy-peaked volcanoes; flamingos and fluffy llamas, sheep, and street dogs; rolling green mountains peeking out behind low clouds; women in colorful long skirts and tall felted-wool hats; stacks of terricotta brick houses climbing up hillsides like ivy. 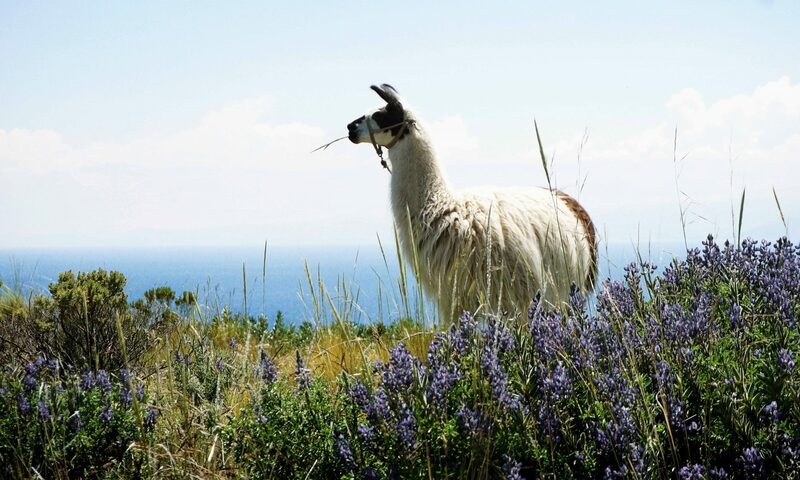 Bolivia is the most visually stunning country in all of South America.